Voice-search has made a huge way in recent years, making its impact apparent especially when it comes to smartphones use. All Google, Microsoft and Apple are continually making considerable efforts to ensure improving quality of the service. Research and development is relentlessly taking place. Things such as wearable devices are quite common to the contemporary population and voice-search and voice commands will play part in everyday life more often regardless of whether it is via Google, Siri or Cortana. Amount of voice-searches doubled last year only. These voice assistants are getting smarter and smarter, with some of them already being able to put the conversation in context. Technology itself is continually being improved as well, with the word error rate dropping to 8% from previous 25% from couple of years ago according to Google. 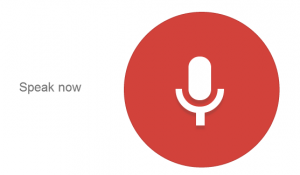 Google itself is currently able to recognize up to 58 languages within its voice system. The ultimate goal is to enable users to have a natural follow-up conversation with the device in contrast with robotic automatic responses. One of the technology obstacles still remains the background noise when making voice commands, though much of the improvement have been made on this matter as well. In any case future is bright for the voice-search and voice commanding, posing the challenge which cannot be overlooked in the near future.